The classic and iconic study of the Resurrection, Who Moved The Stone? is a probing and insightful examination of the gap between Jesus' death and life. The classic text on examining the evidence for the Resurrection. Convinced that the story wasn't true, Frank Morison started to write about Jesus' last days. However, as he studied this crucial period something happened. . .
First published in 1930, this is an in-depth exploration of what happened between the death of Jesus and the resurrection as recorded in the Bible. Using many information sources, this is crammed with vital detail that every Christian should know and is also a powerful tool for persuasion of those questioning Christianity. Writing this book changed Morison's life. Will you let it change yours? 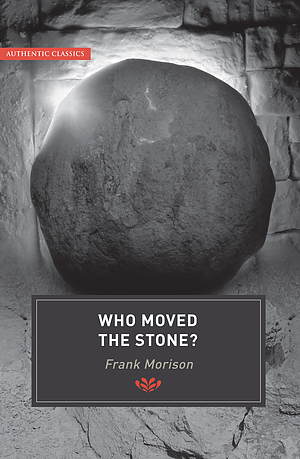 Who Moved The Stone by Frank Morison was published by Authentic in July 2006 and is our 455th best seller. The ISBN for Who Moved The Stone is 9781850786740. Be the first to review Who Moved The Stone! Got a question? No problem! Just click here to ask us about Who Moved The Stone.